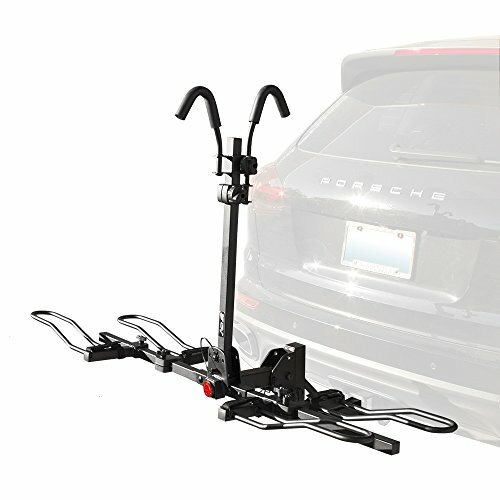 What to look for when buying a bike rack for an SUV? 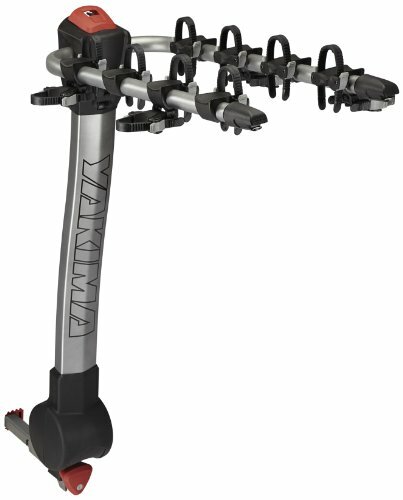 For a super quick to install a bike rack to your SUV, consider this Yakima hitch bike rack, which attaches to your SUV without the need for tools, complete with Speed Knob to safely, securely and speedily lock the rack to your vehicle. Store it easily thanks to its Upper Hand lever which is tilted to enable the bike rack to fold flat for you to store and so that you are able to access your car without having to disassemble the bike rack every time you want to open the boot. Bikes are held in place well due to the removable ZipStrips, and the anti-sway cradle system stops bikes from damaging each other during transportation. Your bikes and their finish are protected with the largely molded collars, capable of holding 45lbs each. Use the rack arm mounts, oversized tubing, and inserts of anti-rotational capacity, to ensure that your bikes arrive safely at their new destination. 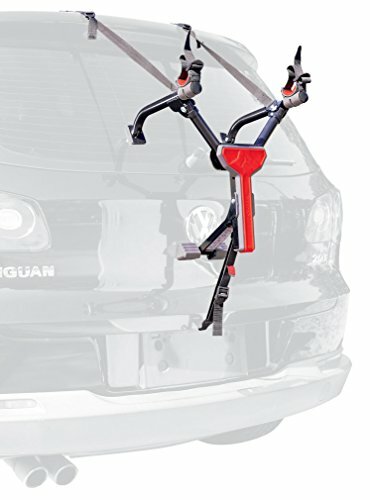 Why We Liked It – We like the Yakima Products Ridgeback Hitch Bike Rack for cars because it is very easy to assemble and fit your vehicle while protecting your bikes fully on their journey. To transport a maximum of three bikes, this is a very viable option of SUV bike rack. It easily connects on to vehicles with a trailer hitch of between 1.25 and 2 inches, so can easily be used between multiple different vehicles if that is a requirement of yours. It has a 16 inch long pair of carrying arms which are able to secure individual bikes through the use of the patented Allen’s tie-down system. This bike rack has arms that are able to fold away quickly when it is not in use, and it can be fully functional within less than 5 minutes. There is no inconvenience encountered with this mounted bike rack for SUVs. Created from steel and finished off with a black powder coat, this is a sturdy and versatile bike rack catering for all of your cycling and transportation needs, easily shareable between multiple capable vehicles. 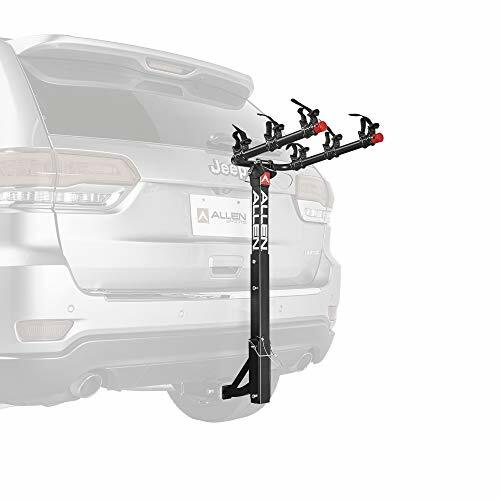 Why We Liked It – We like the Allen Sports Deluxe Hitch Mounted Bike Rack because it’s so easy to use on any vehicle with a 1.25 – 2-inch trailer hitch, securing bikes individually for easy transportation. This Y–shaped bicycle rack is suitable for use when attached to an SUV, sedan, hatchback or minivan, clearly showing its versatility. It has been innovated from steel to enhance its strength, stability and safety features when transporting your bike between locations. This American made bike rack is the ideal carrier of one bike for frequent travelers or for people who commute on a daily basis. Its Y-shape is formed by its 3 padded legs that rest against your vehicle without causing damage to your car or your bike. With 3 adjustable straps, you can rest assured that your bike will reach its location in one piece and without damage. The bike rack is very compact and is ideal for individual users. It even folds up to be so compact that it can fit inside a backpack so that you can take it with you to attach on to another vehicle later on your journey. What could be more convenient! Why We Liked It – We like the Allen Sports Ultra Compact Trunk Mounted Bike Rack because it is so compact that it enables the user to take it with them when they are traveling. A very financially appealing way of transporting a family of bikes is the MaxxHaul bike rack, ideal for family days out, holidays or even as part of a new way of commuting. It is sturdy, durable and able to transport four bikes at any one time. It has a swing down feature, so that rear vehicle access is not prohibited, especially useful on long journeys with the family when the car is already rather full but something has been forgotten in the trunk. This bike rack has been created from steel, is easily adjustable and comes with hook and loop straps to ensure that your bikes remain safe and secure as they travel. Please be aware that this is not a bike rack suitable for RVs or for bikes with slanted handlebars, but other than that there are very few limitations to purchasing this bike rack for your family. 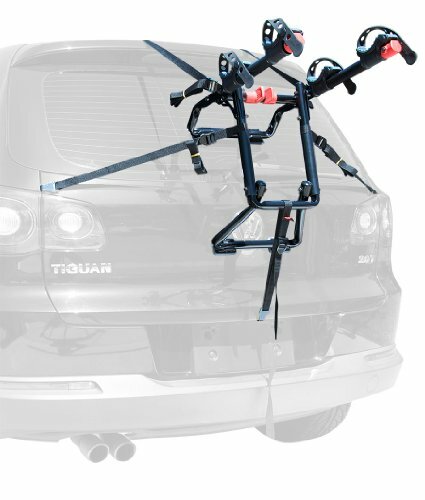 Why We Liked It – We like the MaxxHaul (70210) 4-Bike Deluxe Hitch Mount Rack because it makes traveling with the family, a full car and bikes a really stress-free process to undertake. The patent design of this bike rack has been innovated specifically for SUVs. Holding a maximum of 70 pounds, it’s fully assembled on arrival at your delivery address, so there is very limited DIY for you to do to attach it to your vehicle. You can use it as soon as you receive it. It’s so quick to install, accommodating bikes of any style on its 12 inches long carry arms of 15-inch width. Side straps have been added to increase the stability and security of the transportation of your beloved bikes and use the individual tie-downs to enhance each bikes protection as you travel. 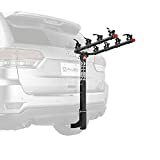 The lower frame of the Allen Sports Deluxe bike rack is padded preventing any damage from being done to your SUV when traveling by bike in addition as it keeps the bikes and the rack from scratching or denting your car. This is a smart, effective and quick way of transporting a maximum of two bikes between locations. 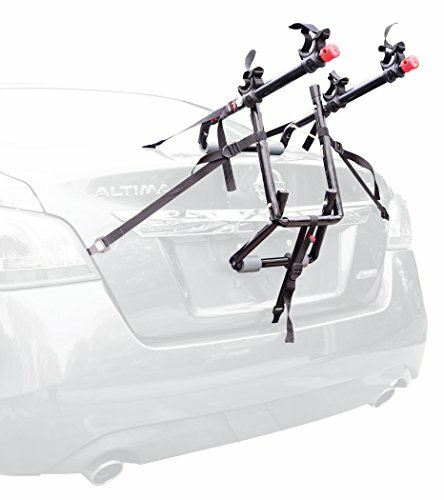 Why We Liked It – We like the Allen Sports Deluxe Trunk Mounted Bike Rack because of the amount of attention that has been paid to protecting your vehicle while traveling with bikes in tow. Arriving at your home 100% fully assembled, if you are a cyclist who is limited for time, this could be a great choice, as no DIY is required and all you need to do is attach it to your vehicle. 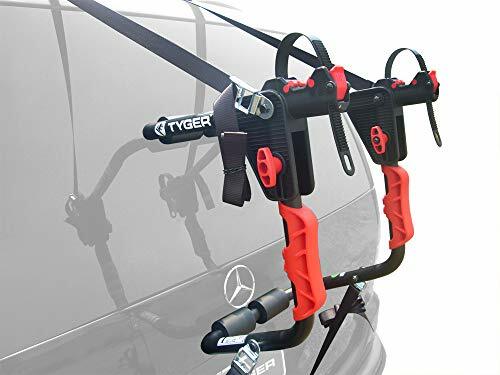 Suitable for SUVs amongst many other vehicle types, the Tyger bike rack is able to transport a maximum of three bikes easily and safely. Its frame is secure and sturdy, and the lower frame is padded to prevent car damage from occurring en route. Use the safety straps to enhance the safety and security of the frame. Each bike transported fits into its own individual soft cradle for its own protection and you can rest easy knowing that the frame has been coated with black E-coating to ensure that it is rust resistant to elongate its longevity. For a quick to install and easy to use a bike rack, this option should definitely be considered. Why We Liked It – We like the Tyger Auto TG-RK3B203S Deluxe 3-Bike Trunk because it allows you to travel with your bikes within just a couple of minutes of it arriving at your delivery address. 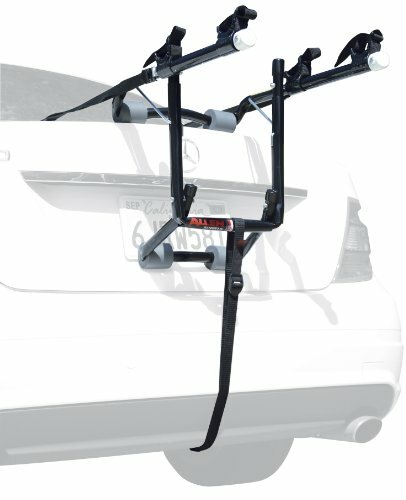 If your bikes are of higher than average weight, then take a look at the Allen Sports Premier bike rack. It cleverly fits on to an SUV and has the bonus addition of extra large protection pads so that weight is distributed in a more even manner than the majority of other bike racks. These car pads are also very effective at protecting your car from bumps, knocks, and scratches often associated with transporting bikes. Time taken to set up this bike rack is drastically reduced through the use of its quick snap set up the patented design so that you can use the bike rack as soon as you receive delivery of it. It has long 12 inches carry arms to hold 2 adult bikes easily, safely and securely, with the dual compound tie-down cradles and strap and hook devices to ensure ultimate road safety when traveling with bikes on the back of your SUV. Why We Liked It – We like the Allen Sports Premier Trunk Mounted Bike Rack because of its clever, quick snap set up, weight distribution and that it can hold heavier bikes than most bike racks. Cleverly designed, this BV bicycle rack looks good and is very effective at space-saving. The rack folds completely flat when not in use reducing the length of your vehicle. Use the tilt-back design to access the rear even when the bike rack is in use without having the hassle of detaching the bike rack from your SUV. With multiple safety reflectors, you and your vehicle are more visible during night driving and driving conditions where the visibility is significantly reduced, like fog, mist, and hail. This not only makes you safer but also makes other drivers, the roads and your bikers safer, too. This bike rack has been designed to have anti-wobble technology 2 ways preventing any movement from occurring between the hitch and the rack when bikes are in situ, preventing scratches, dents, and damage from happening to your bike in transit. Protect your bikes further with the tray-style loop and padded arms, holding bikes securely and preventing damage. Why We Liked It – We like the BV Bike Bicycle Hitch Mount Rack Carrier because it is so safety conscious, enabling you to travel with bikes in the safest possible manner on the road. Looking for something simple but effective and reliable? Look no further. The Allen Sports Deluxe bike rack is the answer you’ve been searching for. It may be simple in its looks and structure but it is very sturdy and reliably transports two bikes from one place to another. It is easy to attach to your vehicle through its innovative single configuration design so that there are no frustrating moments when attempting to set it up and precious cycling time is not wasted. It fits nicely on to an SUV, has long carry arms of 12 inches in length and has a patented tie-down system to protect you, your car and your bikes when you are traveling to your cycling destination. 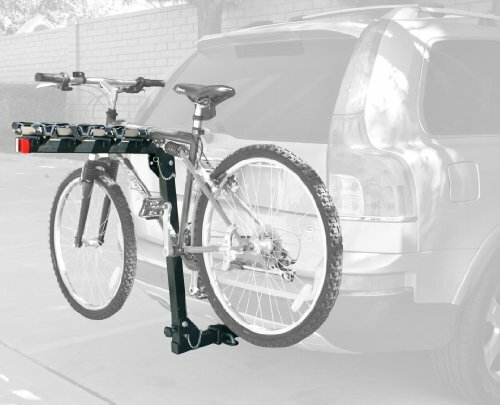 At just 15 inches wide and 23 inches in length, this bike rack does not add any unnecessary length to your car to make maneuvering difficult or dangerous either. Why We Liked It – We like the Allen Sports Deluxe 2-Bike Trunk Mount Rack because it’s so easy to use but won’t let you down when you are traveling with two bikes on your next cycling adventure. In full assembly on receipt, the Tyger Auto bike rack is ready to go from the word off. It fits securely on to an SUV, as long as you do not have a spoiler in the way, enabling you to transport one bike to your desired location. It has been created in a very stable and safe manner, and it’s padded arms prevents any damaging occurring to your bike or your car during transit. It comes with safety straps and has a soft cradle to ensure that your bike is protected in the best way possible. This bike rack is rust resistant thanks to its OE standard black E-coating, and its arms can be folded away so that they are completely flat when the rack is not in use. The Tyger rack takes just a couple of minutes to install and is about as hassle-free as bike carriers get. If DIY just isn’t your thing, then this really is the bike rack for you. Why We Liked It – We like the Tyger Auto TG-RK1B204B Deluxe Black 1-Bike because of its ease of use, bike protection and its ability to foldaway completely flat to save space when stored away. How many bikes will you be transporting? Are you wanting to go on solo adventures at the weekend to escape from work colleagues and family for a couple of hours? Do you want to go exploring with your partner to areas you have heard about but never actually seen? Looking for an activity that the whole family can join in? Whatever you are wanting to do, there are bike racks that cater to your needs. Without stating the obvious, there is no point in you forking out the money for a four-person bike rack if you will only require it to hold one bike, and you don’t want the frustration of ordering a bike rack for the family to discover that the rack only holds two bikes. Certain bike carriers do not appreciate bikes with handlebars stereotypically associated with women’s bikes. If this is the case for a particular bike rack, it will always be stated within its online information, so it’s always worth checking if you will have women’s or even teenage girls bikes in tow. You don’t want a long journey to be hindered by this and continuing to use a bike rack when it has been stated a bike type does not comply with it can be extremely dangerous on the roads. If you are an all-weather cyclist or like cycling in areas of high salt, like places located near the beach, then it would be well worth you investing in an anti-rust bike rack. Not only will this protect the bike rack, keeping it stronger and safer for longer periods of time but it will also stop you from having to spend more money having to replace your bike rack when corrosion occurs, and safety becomes an issue quickly. 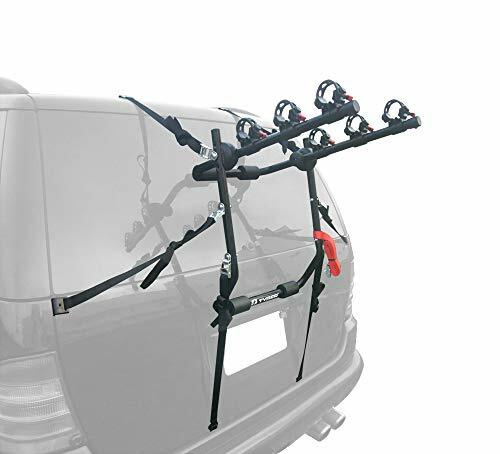 If you go cycling in various location and also take your dogs, then it is well worth thinking about purchasing a bike rack that still allows you to access the rear of your car without having to dismantle the entire bike rack. This will save you huge amounts of time and will prevent you from getting frustrated. This is also great even if you don’t have the dogs but may be going on longer journeys and need something out of your rear luggage. If you don’t have to take off the bike rack to find anything in the boot, it’s just so easy. If you are the driver of an SUV, you need to make sure that the bike rack in question is compatible with an SUV. You must also be aware that the majority of bike racks do not suit any car with a spoiler as they do not attach safely and securely to the car to transport the bikes carefully to your chosen destination. In the product description of all bike racks, it is always specified as to what car the bike rack in question is suitable for. Be sure to check before you make plans and spend money so that you are not disappointed when a non-compatible bike rack arrives at your house. My bike is heavier than average, how can I protect my SUV further? There are many ways to protect your SUV when considering a new bike rack. Look for bike racks with padding, foam and a suitable distance between the bike rack and the car when they are attached to each other. Remember that the more securely attached the bike rack is to the SUV, the less wobble room, and therefore the less the likelihood of damage occurring to your car, your bike or to you. If you have a bike which is heavier than average, you could also think about looking for a bike rack that has extra large protection pads. Not only does this add greater protection, as its name implies, but it also helps the weight of the bike or bikes to be more evenly distributed across the bike rack making it more secure and safer for longer journeys. What do I do with a bike rack when it is not in use? This is a very commonly asked question though to some people it may seem like a strange one. Obviously, when you are using your bike rack, it is fitted firmly, securely and safely to your car enabling you to transport your bikes from one location to another. But when your bike rack is not in use, there are options. For some bike racks, they can simply be left as they are, for others there is the ability to fold them completely flat so that parking and safety are enhanced when the bike rack is empty. There are even bike racks which have a very clever feature of being able to fold up into such a small and compact size that they can fit into a rucksack. This way, once they have enabled you to transport your bike to your desired location, you can carry them while cycling and then use them on another car at the other end. How do I enhance the life of my bike rack? To enhance the life of your bike rack, whether it is attached to an SUV or another type of vehicle, the best way to do so is to buy a bike rack that is resistant to rust. This is the case for bike racks that have been treated in a particular manner through the use of OE standard E-coating available in an array of colors. This will prevent rust, corrosion and general wear and tear of your bike from happening, expanding the life of your bike rack in the process, helping you to transport your bike to more places for much longer periods of time without worry, fuss, hassle, accidents or expense.